DIY Solar Panel <--Coming Soon!! Below is a Brief video of my friends newly flying "Lite Breeze" Wind Generator Kit from windbluepower.com. 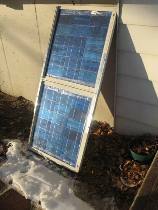 Working on the new DIY Solar panel build pages! Hope to have them up soon, lots of images and tips and tricks!